I'm on pins & needles, anticipating the ABC expo, which will take place Sep 7-10. This is where all the new baby and kids manufacturers will be showcasing their new products for 2015. I can't wait to see what's in store for us from my favorite stroller brands, and eager to discover new, never before seen products. A few sneak peaks can be seen among the 2014 JPMA Innovation Award Nominees. A convenient aspect of an infant car seat is that it can be transferred to a stroller and become a travel system. However, there is a big concern in the medical community that it is not healthy for baby’s spine to be kept in an car seat for long periods of time. The CYBEX Cloud Q is the first infant car seat that, when used on a stroller, can recline completely, becoming a carry cot. A clever mechanism allows the back rest to recline, and the foot end of the seat flattens out and extends to perfectly support the baby. While used in a car, the Cloud Q will have the same Linear Side-Impact Protection as the Aton 2 and Aton Q. The base also comes with a Load Leg. I can't wait for the official unveiling of this car seat at the ABC expo! If like me, you're concerned about exposing your developing newborn to electromagnetic waves, you'd be happy to know that Babymoov has taken a precautionary approach to this problem by developing the first and only 0-emission baby video monitor on the market. The Vue Double is the first side-by-side umbrella stroller that allows each child to face in either direction. The best part is that the seats don't need to be taken out to be reversed. 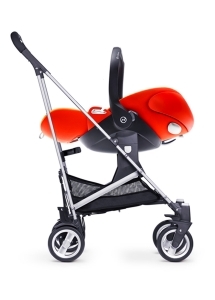 The stroller has a compact, umbrella fold for easy storage. I can't wait get my hands on the Vue Double. Crossing my fingers in hopes that it's easy to push and steer. The Doona car seat is truly innovative, featuring integrated wheels that pop out easily to provide the same sort of mobility you get with a baby travel system, minus the extra frame. 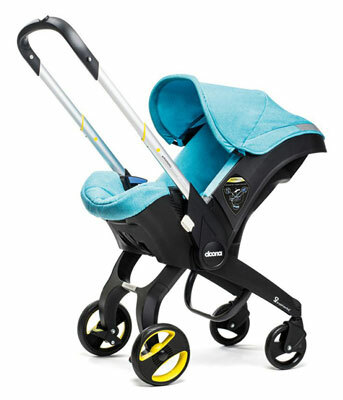 A separate car base, which the Doona clicks easily into, is equipped with a load leg (a feature that’s common in Europe and provides excellent stability for the car seat). A variety of optional accessories, such as rain cover, extendable sun shade, mosquito net, wheel covers, parent console and more will be available as well. This car seat is already available for sale in the UK.